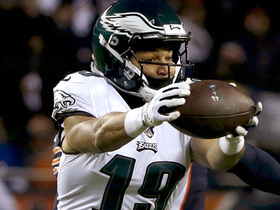 Analysis: Tate nabbed the game-winning touchdown reception a week earlier in the Eagles' wild-card upset of the Bears, but that was one of the only highlights of his tenure in Philadelphia. One of the more high-profile names moved prior to the Oct. 30 trade deadline, Tate failed to make a consistent impact in his 10 games with the Eagles, totaling 37 receptions for 342 yards and two scores on 57 targets. The 30-year-old will become a free agent in March and is likely to take his talents elsewhere. Analysis: Tate followed up back-to-back limited showings Wednesday and Thursday with an uncapped session to wrap up the week. With his knee issue behind him, he can focus on a Saints defense that conceded 20 touchdowns to wideouts this season. Analysis: Tate has opened the week with back-to-back capped sessions, but his knee issue doesn't appear to be one that'll impact his gameday availability Sunday in New Orleans, where he'll be seeking out his third touchdown as a member of the Eagles. Analysis: Tate has been a paragon of health during his nine-year career, missing a combined seven games, five of them during his rookie season in 2010. 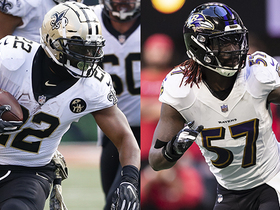 There's little worry about his availability for Sunday's divisional-round contest at New Orleans, where he'll be looking to put a stamp on a second consecutive postseason game. 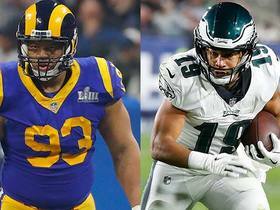 Analysis: Just like that, the Eagles' trade-deadline acquisition of Tate from the Lions was justified. Tate was quiet for most of this one but came up big when it mattered most, catching the game-winning touchdown from two yards out on fourth down with 56 seconds left. Up next for Tate and the Eagles is a road matchup with the Saints. Tate reeled in two of his three targets for 13 yards during Sunday's 32-30 win against the Texans. 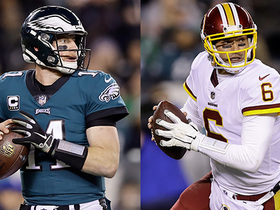 Analysis: Aside from earning between 60 and 71 percent of the snaps on offense Weeks 11 and 12, Tate hasn't received more than 50 percent in any of his five other appearances with the Eagles. His production has responded in kind, with Sunday's target count matching his low in Philadelphia. The impending return of Mike Wallace from injured reserve could further hurt Tate's workload, or at least what's left of it, anyway. Tate caught all five passes thrown his way for 43 yards in Sunday night's 30-23 win over the Rams. Analysis: It was a nice rebound for Tate after just one catch in his previous game, but still probably not what his fantasy owners were hoping for in a playoff week. 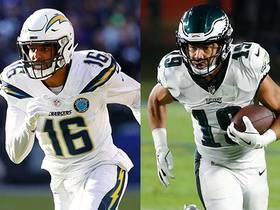 He saw just 22 snaps, barely a third of Nelson Agholor's total. 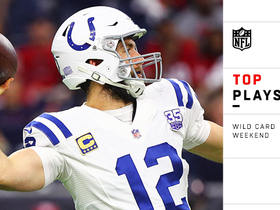 Considering the workload, the 30-year-old will be a risky play Week 16, but it could pay off against the Texans' 26th-ranked pass defense (258.3 yards per game). Tate caught one of three targets for seven yards in Sunday's 29-23 loss to the Cowboys. Tate caught all seven of his targets for 85 yards and a touchdown in Monday night's 28-13 win over the Redskins. He also hauled in a successful two-point conversion. Analysis: Tate got off to a hot start, going for a 19-yard gain and gathering a six-yard touchdown on Philadelphia's first offensive drive. 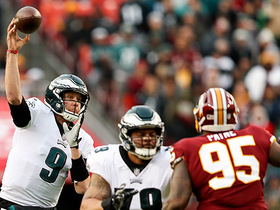 He later ripped off a 32-yard reception, his longest play since joining the Eagles, and secured a two-point conversion to begin the fourth quarter. In doing so, Tate not only caught everything thrown his way, but enjoyed his best game with his new team. That gives him encouraging momentum ahead of Week 14's meeting with the Cowboys. Tate caught four of his eight targets for 30 yards in Sunday's 25-22 win over the Giants. Analysis: Tate co-led the team in targets with Zach Ertz and has now seen at least a share of said team lead in back-to-back games. The Notre Dame product has yet to surpass 48 yards or find the end zone in three weeks with his new team. However, he will have an excellent opportunity to end both streaks in Week 13 against a Washington defense ranked 25th against wide receivers. Tate caught five of eight targets for 48 yards and lost eight yards on a run during Sunday's 48-7 loss to the Saints. Coach Doug Pederson said Tate will take on a larger role Sunday in New Orleans, Dave Zangaro of NBC Sports Philadelphia reports. Analysis: Tate played just 18 of 62 snaps (29 percent) in his first game with the Eagles in Week 10, catching two of four targets for 19 yards in a 27-20 loss to the Cowboys. He should be ready for more playing time Week 11, potentially getting snaps inside against struggling slot cornerback P.J. Williams. 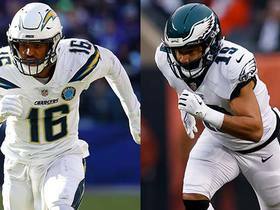 A larger role for Tate likely would come at the expense of Jordan Matthews. 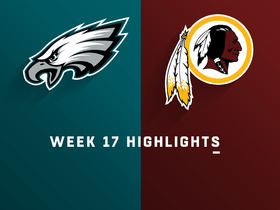 Tate played just 18 of 62 snaps (29 percent) on offense in Sunday's 27-20 loss to Dallas, catching two of four targets for 19 yards, Dave Zangaro of NBC Sports Philadelphia. Tate will make his Eagles debut Sunday against the Cowboys and is expected to be used all around the offensive formation, Ian Rapoport of NFL Network reports. The Lions traded Tate to the Eagles on Tuesday, Adam Schefter of ESPN reports. Analysis: Despite an expectation from Tate that he would remain a Lion beyond Tuesday's 4:00 PM ET trade deadline, he's heading to the reigning Super Bowl champs instead. With Nelson Agholor turning in a disappointing season so far and Mike Wallace (lower leg) on injured reserve, Tate should be an immediate factor as a possession receiver in the Eagles' 16th-ranked passing attack. Tate said Monday that he doesn't expect to be dealt by Tuesday's 4:00 PM ET trade deadline, Dave Birkett of the Detroit Free Press reports. "I don't think so," Tate added. "I feel like I'm a huge part of this organization and this offense especially, so hopefully that's not the case." 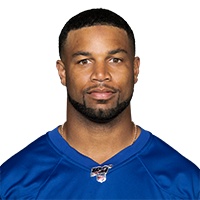 Analysis: Both Tom Pelissero and Ian Rapoport of NFL Network reported Monday that Tate is on the trade block. The development may stem from a combination of Tate's upcoming unrestricted free agency and the emergence of second-year wide receiver Kenny Golladay, who ranks second on the Lions in catches (30) and receiving yards (477) while sitting third in targets (44). Tate would be a welcome addition elsewhere as a possession receiver, but he seems intent on remaining in his current situation. Tate is drawing interest ahead of the Tuesday trade deadline, Tom Pelissero of NFL.com reports. Tate caught seven of 12 targets for 50 yards and added a three-yard run during Sunday's 28-14 loss to Seattle. Tate (ankle) put in a full practice Thursday, Tim Twentyman of the Lions' official site reports. Analysis: As expected, the ankle injury that limited Tate's involvement in Wednesday's session didn't provide cause for concern, given his increased participation one day later. Expect Tate to face no restrictions with his snap count in Week 8 while he takes on a stout Seattle pass defense that has yielded just 206 passing yards per game, good for the third-best mark in the NFL this season. Tate was a limited practice participant Wednesday due to ankle injury, Michael Rothstein of ESPN.com reports. Analysis: Tate may have suffered a minor injury during Sunday's 32-21 win over Miami, but his ability to practice in any capacity puts him on the right path to play when the Lions host the Seahawks this weekend. Improved balance in the Detroit offense has cost Tate some volume the past few games, but he's still managed at least four catches, six targets and 42 scrimmage yards in every contest. He'll look for another quality outing as he takes aim at his former team in Week 8. Tate caught four of six passes for 36 yards and added a 30-yard run during Sunday's 32-21 win over Miami. Tate brought in five of seven targets for 42 yards in the Lions' 31-23 win over the Packers on Sunday. Analysis: Tate played a more modest role than usual, as the Lions jumped out to a big lead and threw the ball a season-low 26 times. However, the veteran possession receiver still paced the team in receptions while checking in second to Kenny Golladay in both receiving yards and targets. Tate's role in the typically pass-happy offense is secure, so he remains an excellent option in all formats heading into a Week 7 battle against the Dolphins following a Week 6 bye. Tate (hip) caught all eight of his targets for 132 yards and two touchdowns during Sunday's 26-24 loss to the Cowboys. Analysis: Tate displayed an outstanding rapport with quarterback Matthew Stafford as he set season highs in catches, yards and touchdowns. His two scores came on big plays of 45 and 38 yards in the first and fourth quarters, respectively. Tate came into the game with a bit of a hip injury and looked hobbled at times, but it would be hard to argue that he was hindered throughout the game. He'll look to build off this outstanding effort next Sunday against the Packers. Tate (hip) is listed as active Sunday at Dallas, Tim Twentyman of the Lions' official site reports. Analysis: A late addition to the Week 4 injury report, Tate will play through a hip concern, as he's done a handful of times previously in his career. Expect him to approach his 2018 target count of 12 per game, which could yield fruit against a Cowboys defense that has allowed 14.6 yards per catch and two touchdowns to wide receivers the last two games. Tate (hip) is expected to suit up Sunday in Dallas, Ian Rapoport of NFL Network reports. Analysis: There was little worry about Tate's Week 4 availability until he appeared on Friday's injury report as a limited practice participant due to a hip issue. Although his health may be somewhat compromised Sunday, Tate should be available to the Lions' passing attack, which has equated to 12 targets per game this season. Tate (hip) was added to the injury report Friday as a limited participant and is listed as questionable for Sunday's game in Dallas. Analysis: A late-week addition is always concerning, but it's at least a good sign that Tate was still listed as a limited participant rather than a DNP. It's nonetheless something to keep an eye on when the Lions release their inactive list approximately 90 minutes before Sunday's 1 PM ET kickoff. TJ Jones likely would take over the slot role if Tate were to be ruled out. Tate caught six of eight targets for 69 yards during Sunday's 26-10 victory over the Patriots. Tate caught seven of 13 targets for 109 yards during Sunday's 30-27 loss to the 49ers. He also rushed once for nine yards. Tate caught seven of 15 targets for 79 yards and a touchdown in Monday night's 48-17 loss to the Jets. Analysis: Tate led the Lions in targets on a night quarterback Matthew Stafford threw four interceptions. Despite Stafford's struggles, Tate provided one of the only high points for Detroit, taking a quick throw 24 yards for a touchdown to start the second half. Following back-to-back 1,000-yard seasons, Tate kicked off the 2018 campaign in fine fashion, even if his team didn't. Tate caught two of four targets for 23 yards in Friday's preseason win over Tampa Bay. Analysis: Tate and the rest of the starting offense played into the third quarter, managing just six points on five drives. The 30-year-old has split snaps with Kenny Golladay in two-receiver formations this preseason, but it isn't a huge concern once Detroit's reliance on three-wide sets is taken into account. The team had three or more WRs on the field for around 85 percent of its passing plays last season, and the current group of tight ends doesn't hint at a major uptick in usage of two-TE formations. Tate (knee) appeared in Friday's preseason game against the Giants but was unable to catch the only pass thrown his direction. Analysis: He didn't do anything of note, but Tate's mere participation is significant after the receiver exited last week's preseason opener with an apparent injury to his right knee. Look for the Tate to be more involved next week in what will likely be the starting offense's last preseason action before the regular season kicks off Sept. 10 in a game against the Jets. Tate took a hit to his knee during Friday's preseason opener against the Raiders and did not return to the game, Kyle Meinke of MLive Media Group reports. Analysis: Tate absorbed the hit on his first and only catch of the game. The receiver immediately left the field afterward and was seen flexing his knee on the sideline. The Lions have yet to comment on the situation, so it's possible Tate isn't dealing with anything serious. Tate hasn't discussed an extension with the Lions, Michael Rothstein of ESPN.com reports. Tate secured all seven of his targets for 104 yards and a touchdown during Sunday's 35-11 victory over Green Bay. He also threw for a two-point conversion. Tate gathered in three of six passes for 14 yards during Sunday's 26-17 defeat at Cincinnati. Tate caught three of five targets for 33 yards during Saturday's 20-10 victory over the Bears. Tate brought in eight of nine passes for 85 yards and a touchdown in Sunday's 24-21 win over the Buccaneers. Analysis: Tate now has back-to-back eight-catch outings following a two-week lull during which he posted a modest seven catches for 39 yards. The 29-year-old PPR superstar's five-yard touchdown in the second quarter was his first since Week 10 and allowed him to equal last season's total with three games still remaining. He'll look to continue his quest for a second straight 1,000-yard season against the Bears in Week 15. Tate caught eight of 10 passes for 69 yards during Sunday's 14-9 loss to the Ravens. Analysis: Tate led the team in both targets and receptions, but he struggled to produce much aside from his long catch of 24 yards. He totaled just seven catches for 39 yards over his previous two games, so even this modest showing is an improvement on his recent production. Tate remains one of the team's top offensive options and will have a chance to thrive next week against a struggling Buccaneers defense. Tate secured four of eight targets for seven yards while rushing twice for 13 yards during Thursday's 30-23 loss to the Vikings. He also returned one punt for 13 yards. Tate grabbed three of four targets for 32 yards in Sunday's 27-24 win over Chicago. Tate caught six of seven targets for 97 yards and a touchdown in Sunday's 38-24 win over the Browns. Analysis: Tate's 40-yard touchdown with 4:28 to play completed the scoring while putting the contest firmly out of reach. He's been phenomenal over his past four appearances, hauling in 27 receptions for 392 yards and two touchdowns while notching at least 86 yards in every game during that stretch. Start Tate with confidence next week in Chicago. Tate caught seven of nine targets for 113 yards in Monday night's 30-17 win over the Packers. Analysis: Tate led Detroit in receiving yards, consistently causing the Packers problems from his slot position. Along with having caught seven passes in three straight games, Tate has also topped 85 yards in each game over that span. Such success puts Tate in a great spot ahead of Sunday's visit from the hapless Browns. Tate didn't appear on the Lions' injury report Thursday. Analysis: In the portion of practice open to the media, Tate was seen in a non-contact jersey, which wouldn't have been surprising after playing through an AC joint sprain Sunday. Avoiding the injury report altogether, he clearly was able to handle every rep by the end of Thursday's session. He'll thus prepare for Monday's road matchup against a Packers defense that has yielded 8.6 YPT and six touchdowns to wideouts this season. Tate was seen wearing a red no-contact jersey at Thursday's practice, Justin Rogers of The Detroit News reports. Analysis: Tate whittled down what was expected to be a multi-week absence into just one with the help of a Week 7 bye. While he was third in offensive snaps (62 percent) behind Marvin Jones (96 percent) and TJ Jones (73 percent) on Sunday against the Steelers, Tate still led the Lions with seven receptions en route to 86 yards on eight targets. If Tate is indeed absent Thursday, it could be for routine maintenance, but the injury report will confirm if an ailment is to blame. NFL Network's Peter Schrager talks about cool plays from the Philadelphia Eagles vs. Chicago Bears game. 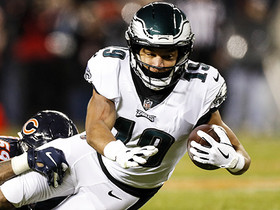 NFL Network's Daniel Jeremiah breaks down how Philadelphia Eagles wide receiver Golden Tate became the Eagles' X-factor in their NFC Wild Card win over the Chicago Bears.